Wow! I can hardly believe it is Christmas Eve. I can remember holidays when I was young. My sister and I were relentless in begging my mom to let us start opening gifts early. 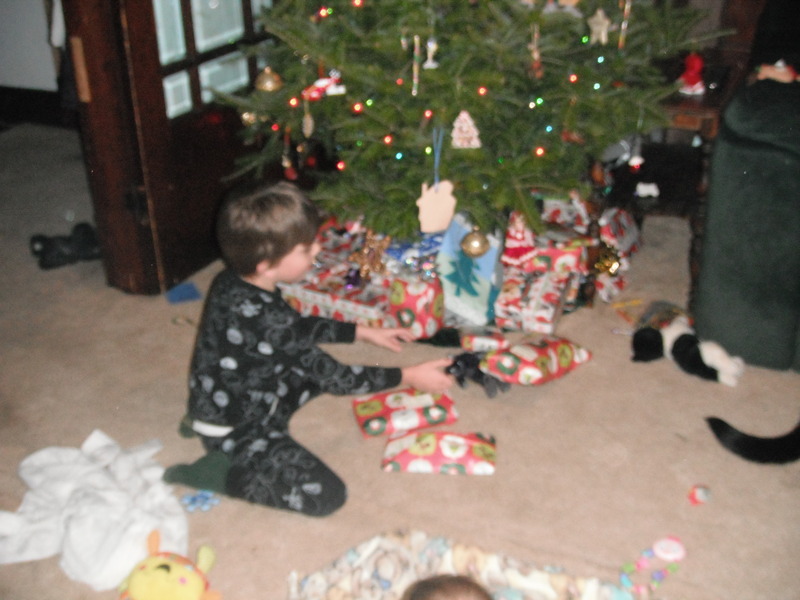 So relentless, that it actually began a tradition for us to open one gift on Christmas Eve-Eve, another on Christmas Eve and the rest Christmas day. I read an article online recently written by a mother who unashamedly explained why she spoils her little girl with Christmas gifts. As a single mother with twins, my mom did not have the kind of budget to allow for extra candy bars in the grocery line or spontaneous toys buys throughout the year. She had to say “no” to us a lot. But when Christmas came…she always pulled out all the stops. Every year was an overload of gifts for my sister and I and it was…MAGICAL. Now as a parent of three with limited means myself, I understand how hard it is to refuse your children even the small things that might bring them joy because we have such little wiggle room in our budget. Seeing their disappointment is difficult, but I also know how important it is for them to understand that you cannot always have exactly what you want the moment you want it. Sometimes you have to work for it, sometimes you have to accept that some things are just not possible right now. But when Christmas comes, like my mother, I find it hard not to jump into the spirit of the holiday with both feet. I love the anticipation of seeing my kids eyes widen with the kind of excitement and wonder that a stack of brightly wrapped presents can create. And the absolute elation when they open something and find exactly what they wanted and have been dreaming of for weeks. Such happiness may be fleeting, but for children who do not yet have to focus on the big picture that adults tend to constantly be distracted by, at least the happiness is PURE. And that is beautiful. So when those little munchkins come begging to start opening gifts early, I resist. Far more than my mother ever did. Even when their Dad gets in on their side, I shake my head. No. Because I want to savor that morning when we are all sitting around as a family in our pjs, anticipating the magic about to commence, smiling and joyful and connected. But it always seems to be over so quickly once it starts. I dread that moment when the kids look around and see that they have opened everything, no more surprises remain. Soon after that, the magic slowly dissipates. So I resist taking away from that morning by even one gift opened early. However, this year it’s not just my kids and their dad begging to start the festivities early. My sister and her family are staying with us for an extended visit over the holidays. I had almost forgotten just how single-minded and impatient my sister was when it came to opening presents. I realize that my mother may have given in all those years on the strength of my sister’s unflagging determination alone. I also realize in trying to convince her to wait, that there is some magic to be found in sneaking a present early. In a way it can up the anticipation and prolong the joy involved in this particular aspect of the holiday season. So… needless to say, last night after dinner my family and my sister’s family sat down to open one present each.